"Rooms are not clean and the service is terrible?" Sleeping in Venice and the air conditioning does not work when the weather conditions are extremely hot? Yes, hot. But, all reasonable hotels have air conditioning or have a comfortable marble stone floor. You will sleep in a 17th century accommodation, transformed into a hotel. Experienced a terrible night in Venice hotel? Please let me know or write a review. Believe me... Are you someone who is planning a romantic night in Venice? 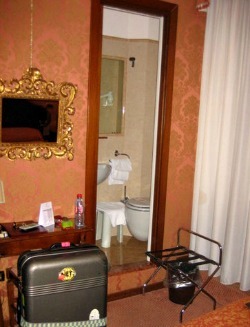 You must choose a classy hotel. And the winner is,,,, for the best place sleeping in Venice and comparing rates and quality: Hotel Lisbona!!! Small rooms but a great place with a simple breakfast. Near St. Mark 's Square in a trendy shopping area. Next to a canal where gondolas are. Which neighbourhood and district do you prefer? People want action and sights like the St. Mark's Square. Others prefer to sleep in another neighbourhood of Venice. Do not forget that the city is small. Everything is easily accessible. Your feet are the most important! Use a map to see where the hotel is. The hotels I've stayed are good and each hotel has its own charm. Venice Centre (San Marco area): 4-star Hotel Rialto next to the Grand Canal. Decent rooms in a lively area in Venice. Next to the Rialto Bridge in Venice. 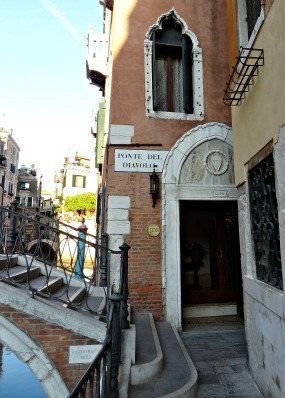 Wondering which hotel I suggest more in downtown Venice? Click here for my page about hotels in Venice center. Castello: 4-star Hotel Palazzo Priuli in an area just outside the tourist flow. But, ideal to do all within walking distance. From the vaporetto / Alilaguna boat the hotel is difficult to find. Look closely at the map on my page. 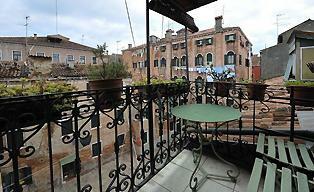 Cannaregio: 3-star Hotel Abbazia near the train station. In a beautiful area on the north side of Venice. The hotel has a garden where you can enjoy delicious food. By vaporetto boat the San Mark Square is easy to reach. Santa Croce: 3-star Hotel Arlecchino is a wonderful sleeping place in Venice when you arrive at Piazzale Roma. The neighbourhood has nice squares for a delicious cappuccino. 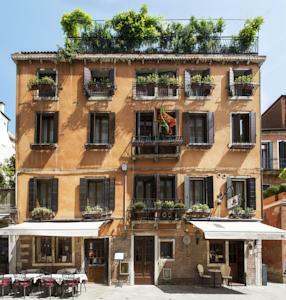 San Polo: 3-star Hotel Marconi is easily accessible from the Grand Canal. Compact rooms and a simple breakfast. When checking in you will receive a map of Venice. The neighbourhood is ideal in the centre of Venice. Venice Lido: 3-star Hotel Byron is a great location on the island across the lagoon of Venice. 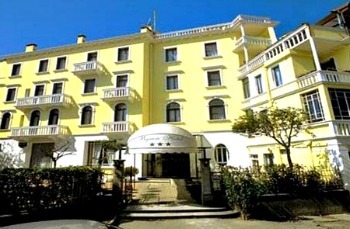 A historic building with elegant rooms and near the beach of Lido! By vaporetto boat You'll be in Venice in 20 minutes. Giudecca: 3 stars Hotel Domina Home Giudecca. A simple hotel between the most expensive hotels of Venice. On a quiet island close to St. Mark's Square and easily accessible. Dorsoduro: 3 stars Hotel Agli Alboretti is located in a lovely neighbourhood. Peggy Guggenheim and the Gallery dell 'Accademia are nearby. These museums you must visit. An easy reach by vaporetto boat via the Grand Canal. When sleeping in Venice you can experience the night in this beautiful city. Venice is fun at night; the day trippers are gone, leaving the streets empty and you can enjoy the intimate atmosphere. From theater to fine dining and to outdoor concerts. The choice of activities in this remarkable city is endless. A watery world where you can walk along canals, stopping for a glass of wine and eating Venetian tapas, called Cicchetti. Sleeping at Venice? There is plenty to explore. Read my site on Venice and get more information about this beautiful Italian city.